Here at the perch, we currently have five budgies (and one cockatiel who thinks he is a budgie). Following are the first three budgies we had. Since then, we lost Soma to complications from egglaying, which deeply saddened us. Sunny, a mauve budgie who is special needs, has since joined us, along with Sprite and Sango! Cool fact: Sprite was named by one of our followers on YouTube! Siri is a lutino who came to us first. 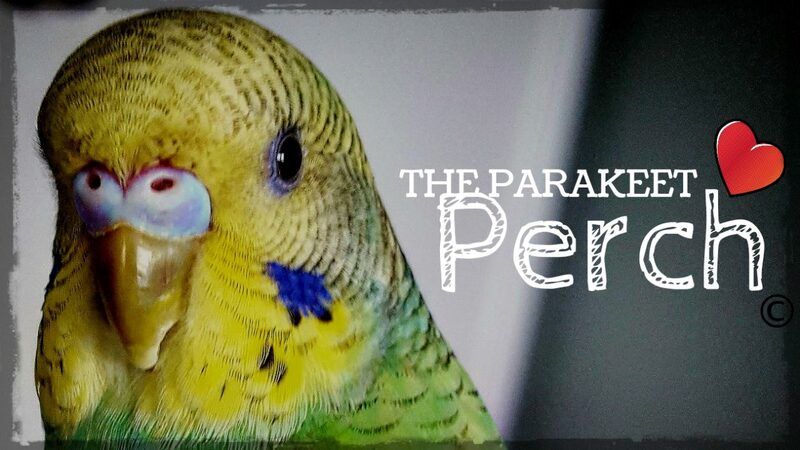 She is a little girl with a BIG personality, and her favorite things are staying busy, chewing up birdie kabobs, admiring herself in the mirror and squawking loudly when she wants something (primarily to be let out of her cage). She came to us in July 2013 and was about 3 months old. After Siri, we acquired Soma in August 2013, also at around 3 months old. Soma was an albino budgie and much quieter than Siri, but still full of personality and charm. Soma enjoyed watching people and being talked to. She also loved taking baths and sitting on eggs. As of Aril 2015, we have had Segoe. He came to us at about 3 months old as well, and was a very colorful addition to our flock! Segoe is a yellowface type II, sky blue, pied opaline! As with our other two birds, Segoe has that outgoing budgie personality we love so much! Since he’s a male, he loves to be extra chatty and has learned a few words from our cockatiel, who talks regularly. He loves to make a purring sound, hang upside down in the cage, flirt with Siri and eat millet. Here is a particularly sweet video showing Segoe when we first got him! How cute was he??? Since January 2018, we have had Sango and Sprite. Sprite is a very outgoing little hen who loves toys more than any of the other birds. She has a rainbow colored breast and tail and we hope to breed her after a year in order to get some cute, colorful babies!!! Sango is our very shy bird. He is a bit fearful but loves to be whistled to and interacted with from a distance (at least where people are concerned). We look forward to doing some training with him to help him build confidence! Visit us on Instagram and Facebook for more pictures and information about our birds! Be sure to also check out some of our videos on our YouTube channel as well. Click here to see our birds in action!